Welcome back to Day 5 of the Anni-VERVE-sary Spotlight Hops! It's an exciting day as there's new Verve in the store this morning! 4 beautiful new sets and 2 coordinating die sets just released and they're all available to order right now. To celebrate this special 10th Anni-VERVE-sary release, we're putting on another blog hop, with a pretty cool prize! 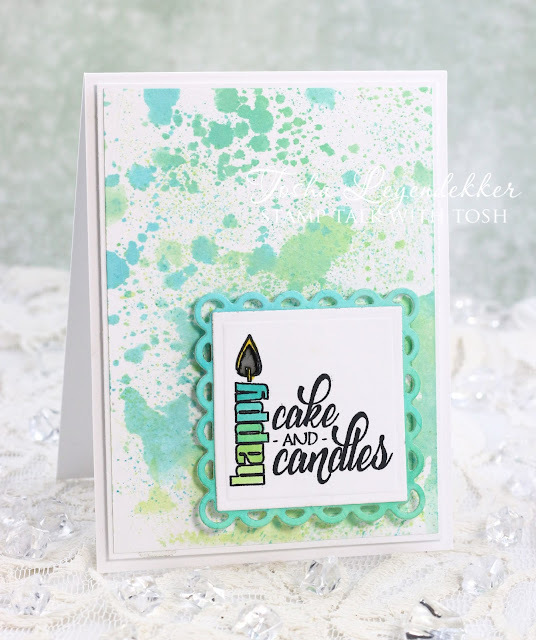 I'm super excited to share the card I made today using Verve's new set called Cake and Candles!! 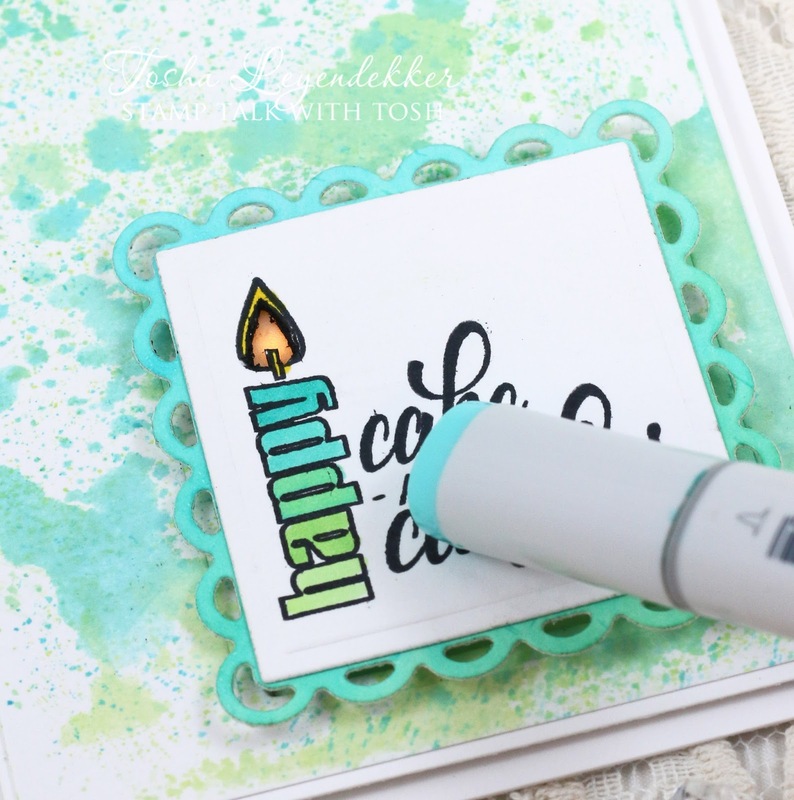 I knew as soon as I saw the "Happy Cake and Candles" sentiment, that I was going to try something I have wanted to for quite some time. I just needed the right image. I bought a Chibi Lights kit quite awhile back and never got around to using it....until today that is!! It was super easy too. I used the "Light up Interactive Card" tutorial by Jennifer McGuire and it came together perfectly. Seriously...no mishaps. And for me...that is seriously rare!! In this close up, you can see the candle lighting up with a push on the sentiment. Isn't that just super fun? And the background was just as easy. I just sprayed some Peacock Feathers and Twisted Citron Distress spray Stain onto my craft mat, and added some spritzes of water to it. I then laid some cardstock over the ink and voila...a beautiful splotchy background!! This card was so easy and super fun!!! That about sums up my project for today's hop. So, want to win some shiny new Verve? Today's prize is a BIG one. We'll be picking a random commenter on one of the hop spots below to win our ENTIRE new release! So be sure to leave a little comment on all the blogs below to increase your chances! Check out the Verve Blog today for all the prize info and deadlines! Thank you so much for dropping by and for sharing your kind comments! You are a blessing!! Welcome to Day 3 of the Anni-VERVE-sary Spotlight Hops! It's time for another day of spotlighting the Verve release with the Verve Divas and special guests! I am super excited to be guest designing for Verve to help celebrate it's 10 year Anniversary. How awesome is that. I had the privilege of being on the Verve Design Team from 2009-2012, and it was seriously an honor. Today we're sharing our first projects featuring the Cake and Candles stamp set, another fusion of old and new. 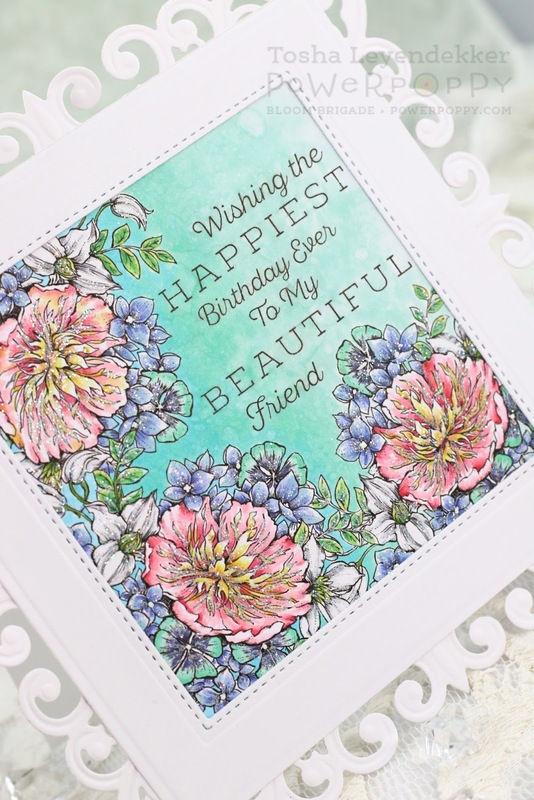 This birthday themed compilation includes some brand new birthday sentiments with a classy modern font pairing, as well as a few re-introductions of previous sentiments and plain janes. 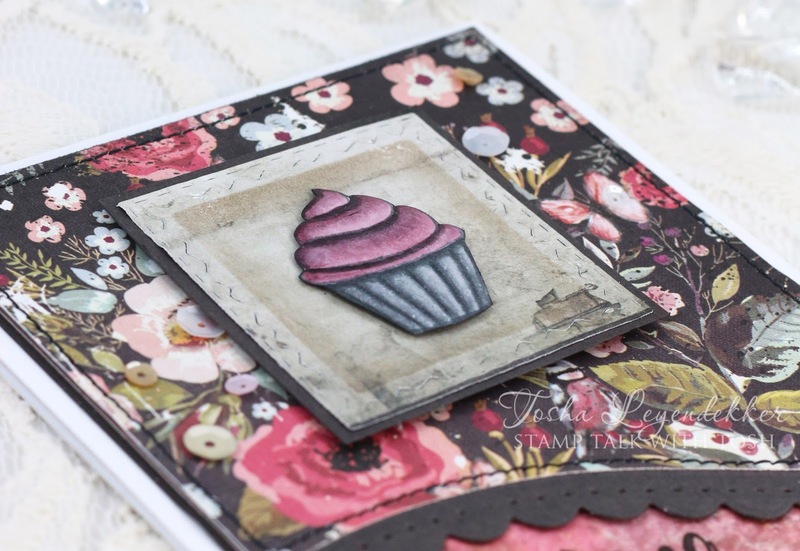 I decided to go a bit vintage with the cupcake in this set. 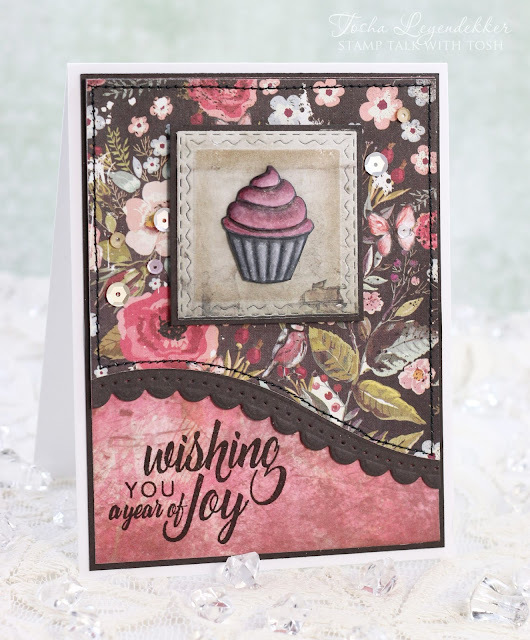 I stamped the cupcake with Gray Flannel Memento Ink, onto X-Press It cardstock and colored it with Copics. I cut it out and burnished it to give it some texture and dimension, and popped it up on some Rossi Belle Prima Cardstock. Below is a close up so you can see the dimension of the cupcake a bit better. If you click on the photo, you can see how the frosting is puffed up, and the cupcake wrapper is pleated. Everything previewed this week will be available to order in the Verve online store on Monday, August 28. If you just can't wait, you can pre-order the entire release now as the August 2017 Buy it All Bundle at a 30% discount through August 27. If you haven't already, check out today's hop list. You won't want to miss a stop!! Thanks a bunch for dropping by!! I hope you are enjoying the Verve previews!! Hello, hello, hello creative peeps!! It's FRIDAY!!!! 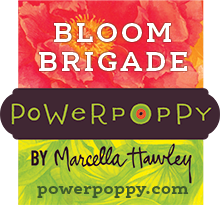 And that means I get to share my latest Power Poppy creation with you! 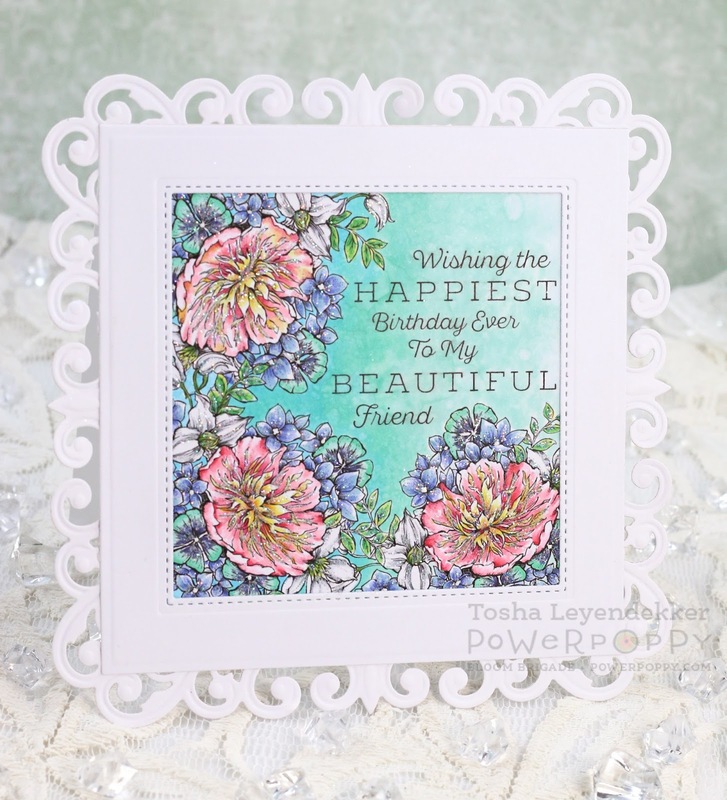 I had a super fun time playing with Power Poppy's Digital set called Luminous Bouquet. It has a stunning Japanese Poppy as its centerpiece and is beautifully enhanced by clusters of Hydrangea petals, Clemanits and Oxalis leaves. I started by opening a blank page in Photoshop and added the image to the three corners. But, when I wanted to add the sentiment, it didn't fit right. So, I thought, why not manipulate it. It's really easy and if you're interested in knowing how I did it, check out the Power Poppy Blog Sept. 4 for a tutorial. I've included a closeup below so you can see the sparkle (that I added using a Quickie Glue Pen and Dazzling Diamonds (SU!) glitter), and the distressed background. I achieved that by laying the Speckles stencil (Tim Holtz) over the colored portion, and, with a cotton ball, I dabbed Colorless Blending Solution over it. I colored the flowers AFTER distressing my background. Thanks a bunch for dropping by! I hope you had a great week, and that your weekend is even better! Happy Friday!!! 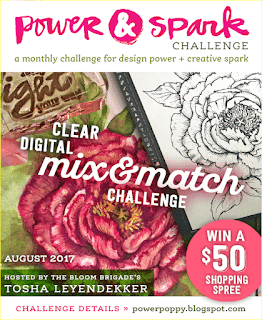 I hope y'all are ready for a new Power Poppy Power and Spark challenge! I thought it would be fun to "Mix and Match" some Power Poppy stamp sets this month!! All you have to do is use at least two different Power Poppy stamp sets on your project. It could be two clear sets, two digital sets, or if you're feeling really adventurous, use digital and clear! What!?!?!? If you only have one Power Poppy set, please don't let that stop you from participating. Just use it along with whatever else you have. Or you could just quick purchase a digital set. It's really quick and easy to do. Anyway...on to my project. 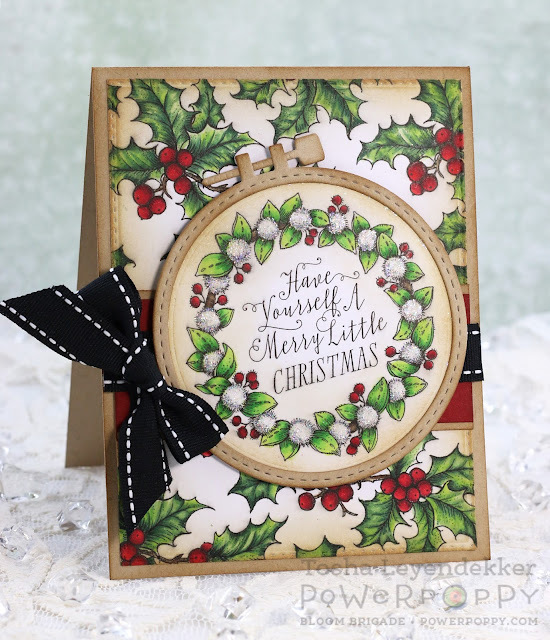 I combined two Christmas themed digital sets: Hollyberries and Wreath: Felt Leaves and Fruit. 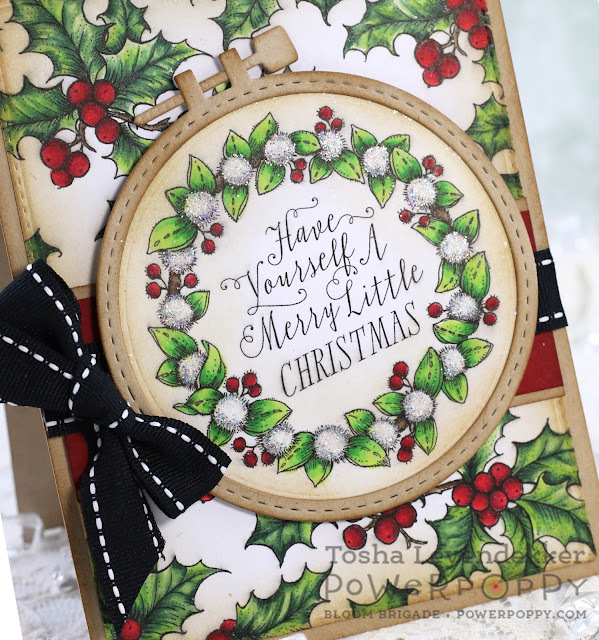 There is also a Holly image in the clear set called Holly Golightly, but I wanted my image larger and with digital images, I can make them as large as I want. I started by creating my background with the Hollyberries set in Photoshop. I printed it out and diecut it using Stitched Rectangles (Waltzingmouse). I then printed out the Wreath: Felt Leaves and Fruit set separately. Everything was colored with Copics, and I added a bit of sparkle to the white pom-poms. Below is a close up so you can see the sparkle better. For all the details, and how you can participate in this month's Power Poppy Power and Spark Challenge, be sure to check out the Power Poppy blog. We'd love to see how you "Mix it Up"!